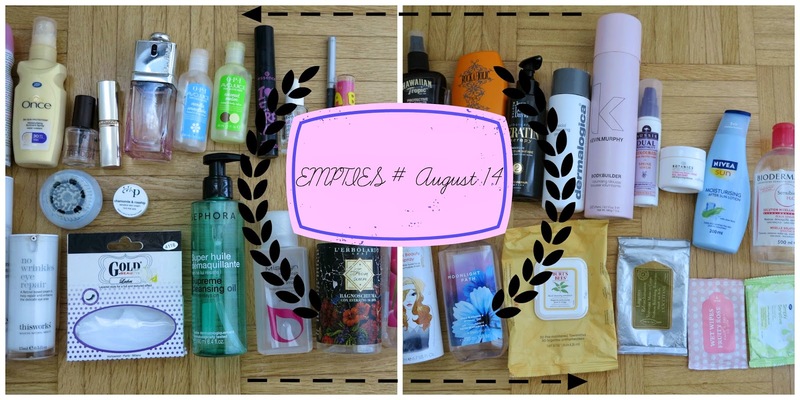 As you can see from the photo above, I managed to use up so many products in the last month! But I promise, I will try to keep as short as possible in my following reviews XD . So let's get started!!! 15. Camille & Rosehip Calming Day Cream Pai (sample) This sample was a nice gift arrived with my order at allforeves.com. It had a nice easy-to-be-absorbed texture, although I was not a big fan of the Camille scent. Definitely I did not use enough to have a proper opinion about it. full size? maybe! 30. I love Extreme Volume Mascara Essence (2,75€) No no no no. Sorry but I really don't understand the hype on this product...I hoped I could love it...but really no way for me. First, I found really hard to use it as its brush was bigger than my nose - no kidding!- and at the beginning when it was new, I just could not avoid to make a mess with it.. As times went by, and the formula dried it up a bit...I still did not manage to like it. It did absolutely nothing to my poor short and fair lashes. I also noticed that in the evening, the product dried on my lashes and started falling in little pieces on my cheeks - yes, not nice! I wish I could find something positive to say...oh yes, it is super cheap. XD rating FAIL! 35 Products....Well, if you are still reading this...thank you so much :D ! Do you know any of these products? Have you tried it? Let me know what you think in the comments below! cara!hai ragione le goccine sono ultra oleose- di solito le uso anch'io solo all'ultima passata di smalto...che poi puntualmente rovino in ogni caso perche' non so stare ferma XD! Comunque quelle di Opi sono ancora meglio....ma costano un sacco!! !eheh i prodotti sono tanti perche' lo scorso mese ho saltato il post - mea culpa!! !